James Winzar, managing director of Insite Graphics, says a team that communicates well can become greater than the sum of its parts. Working in the field of large format print for events and exhibitions is as much a people business as it is a production business, and that means it’s crucial for all of our staff to be able to communicate well with each other, and with clients especially. Building a successful team, like the one we have at Insite Graphics, has been a matter of employing the best people we can afford. To risk a sporting analogy, a strong team needs creative midfielders, a blend of youth and experience, a solid defensive unit and sweepers to pick up the pieces, as well as skilled coaches, strikers and subs. The point is that a team that communicates well and has the requisite talent and experience can become greater than the sum of its parts. Our company has fairly rigidly defined departments on paper, sales, production, installation and more, but our account managers in particular are heavily involved in the design, planning and onsite delivery as well as providing exemplary customer service. It’s the account managers’ job to build long-term relationships with clients, and provide the bridge between the client, and our designers and installers. Every client should feel they have a friend in business, fighting their corner and helping them realise their plans and ambitions. Many of Insite Graphics’s new clients are simply old clients that have moved to new firms, and that’s a direct benefit from finding, and importantly, retaining, staff with strong interpersonal skills. Finding the right people is important, but without team spirit, you have a collection of talent, not a team. Creating this esprit de corps is not an exact science of people management, because it depends on a dynamic that is shaped by not just the business, but by the personalities and relationships at work within it. Retaining excellent staff is very important to us. We give our staff as much autonomy as possible within their roles, because it not only endows greater sense of self-determination and job satisfaction, it also gives our staff the freedom to innovate, and a sense that we don’t simply value their labour, but their ideas too. We’ve purposely kept the hierarchy at Insite Graphics as flat as possible to encourage the free flow of ideas from the shop floor to the boardroom and vice versa. Creating a culture where learning and training is not just encouraged, but actively supported, improves the skills base of the whole company and sends the message to employees that they are valued, integral parts of the business. In an industry that has been shaped, effectively revolutionised, by digital technology, we have had to ensure that new developments in print production and processes have been backed by solid commitments to continuous professional development and training. We want to encourage as much knowledge share within the company as possible, and once again it’s our account executives who really provide the conduit for this. 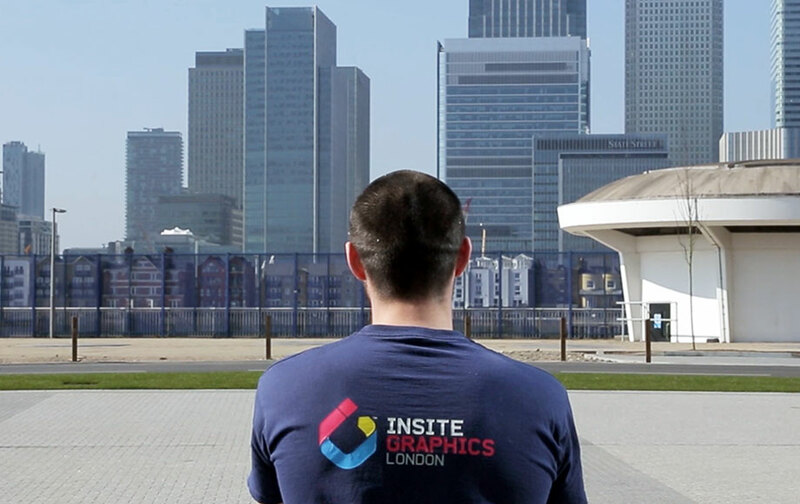 All Insite Graphics staff need to be familiar, at some level, with the whole business process from contract negotiation to delivery and de-rig. This enables account managers to budget realistically, because they know what any given piece of work will involve in terms of material, manpower and logistics. It enables designers to work directly with clients, improving client engagement and delivering better service. It enables better customer service, because all our staff have a stake in the outcome. We work hard, but there is a great deal of humour at play the whole time. We’ve always tried to create a light-hearted working environment because a remorselessly humourless atmosphere can quickly become oppressive in a creative business like ours. We have a lot of fun, but there’s a serious side to our levity, because it keeps people talking. In a positive atmosphere staff are much more likely to speak up if there’s a problem or to share a great idea. And, of course, any good business will look after its staff. This is so important to staff retention. We have very talented people at Insite Graphics, who work extremely well as a team. By investing in their welfare and enjoyment as well as their training and professional development, I think we strengthen that sense of joint enterprise and shared rewards that keeps our staff motivated and positive, and our clients benefit from working with a team that really is a team, and not just a collection of individuals.